Dogoszhi Black-on-white jar from the Museum of Northern Arizona collections. Click the image to open the Dogoszhi Black-on-white gallery. 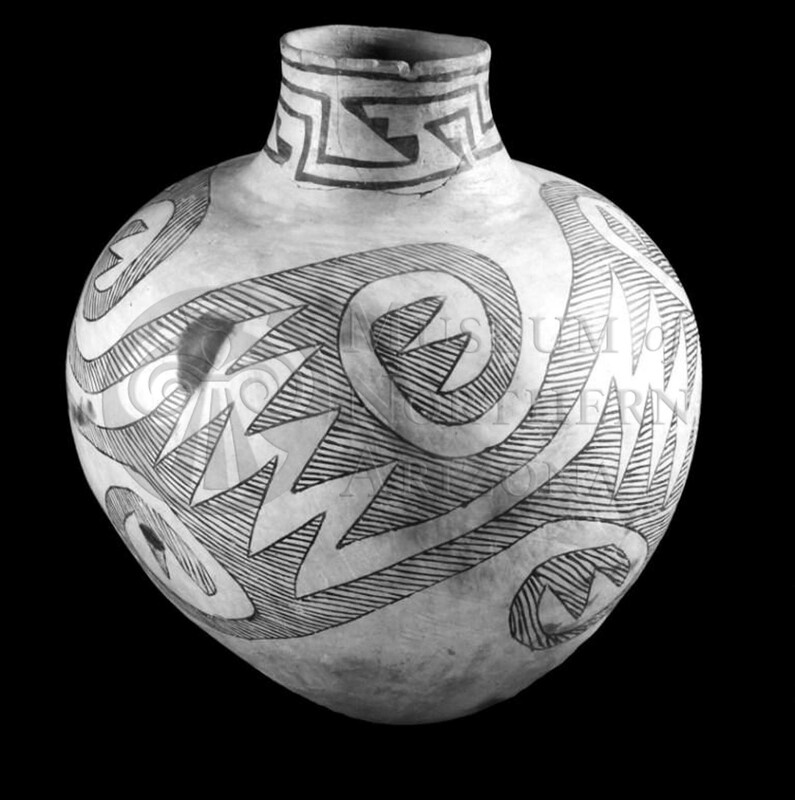 Dogozshi Black-on-white is a Tusayan White Ware type characterized by the use of narrow hachure in its designs and found across northeastern Arizona. Date Range: Kayenta Heartland: A.D. 1050-1190 (Christenson 1994), Flagstaff Region: A.D. 1075-1200 (per Christian Downum, Northern Arizona University). Temper: Abundant fine quartz sand; opaque angular fragments rare. Surface Finish: Bowl exteriors are scraped, with the marks usually very noticeable; sometimes polished; interior bowls and exterior jars: usually more smoothly polished than exterior surface of bowls; the interior surfaces of jars are scraped, with the surface almost always compacted; rarely thinly slipped. Surface Color: White, usually with slight bluish-gray tint. Vessel Thickness: 3.6 to 5.8 mm; jars: 3.5 to 5.8 mm (bowls). Design: Confined to bowl interiors and jar exteriors; no rim decoration; bowl bottoms and jar bases undecorated. Patterns: rectangular, triangular, sometimes curved panels containing diagonal or vertical narrow line hatching; rectangular panels almost always much greater in one direction than in other; width of hatching and framing lines usually the same, varying from 1 to 3 mm, framing lines occasionally as wide as 4.5 mm; individual hachure vary considerably in width, spaces between hatchures about equal to width of hatchures; hatchures occasionally wavy; design often begins just below rim with narrow border line; panels may begin at rim or be pendent from connecting line just below rim; rarely any other motif in design; treatment bold, uneven, often sloppy with intersecting lines overlapping as in Kana-a Black-on white. Comparisons: Polacca Black-on-white has bolder hatching, less regular in execution; panels cover larger areas, less elongated in band form; spaces between hachure wider than hachures themselves; hatching usually combined with solid elements; framing lines usually wider than hachures. Padre Black-on-white has dark gray paste; temper usually white angular fragments; surface heavily slipped and well-polished; paint usually denser. Gallup Black-on-white has similar designs but with mineral paint. Other Names: Black-on-white Ware, Proto-Kayenta Black-on-white, Black Mesa Pueblo II Black-on-white, Virgin Black-on-white.